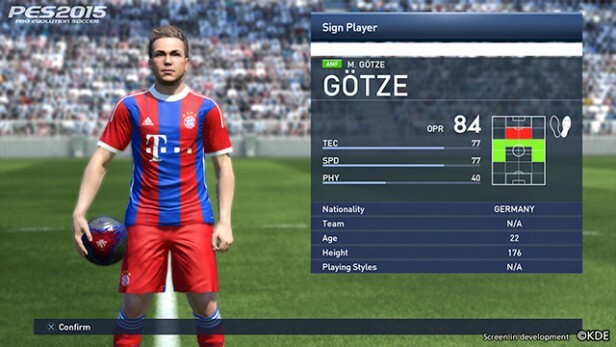 Every player is assigned a playing style in PES 2015. This short post will list all the playing styles available in PES 2015. Description: A player who attracts the defence to create space for other players to exploit. Description: A striker who lurks in the opposition 18 yards box just waiting for the ball. Description: A player who becomes the focal point of attack by holding the ball up in an advanced position. Description: A player who likes to drop off into a deeper position in order to orchestrate the attack. Description: The winger / striker who likes to cut in from wide into the central area looking to score.. Description: An old-style static playmaker who makes use of deft touches and passes rather than pace or movement. Description: A player who looks to make runs into the opposition goal when the team is on the attack. Description: A player who tirelessly covers every blade of grass for the full 90 minutes. Description: A tenacious player who prevents opposition attacks through hard tackling and pressing. Description: A deep sitting defensive midfielder protecting the backline. Description: A player who likes to drop back in order to receive the ball and trigger attacks from deep. Description: A player who always look to strike a perfect balance in attack and defence. Description: A defender who likes to join in the attack and lay siege on the opposition goal at every given opportunity. Description: An attack-minded full back who will run upfield and join the attack when presented with a chance. Description: A solid fullback who prefers to stay back and stick to defensive duties. Description: A keeper playing a sweeper type role who often comes out to cover the area behind the defence. Description: A solid keeper who prefers to stay around the goal line. Try and sign players with playing styles that fits your preferred style of play. For example, if you like attacking down the flanks, you should have ‘Prolific Wingers’, ‘Target Man’, and ‘Offensive Fullback’ in your team. To play a passing game, get players who are ‘Classic No.10’ and ‘Build Up’. In my opinion, ‘Anchor Man’ and ‘The Destroyer’ are crucial for every team. Having a team of players with a variety of playing styles allows you to change your game according to how your opponent plays. So what are your preferred playing styles? yea it works for some styles. 2 destroyer will help you dominate the midfield, 2 wingers make sense too. However, I won’t recommend it work styles such as Target Man, as the players might get in each others way.